A white picket fence lined one half of a hangar’s entrance, channeling people to an open area inside with plants placed beside park benches. Directly across from them, a long, black wall stretched across the area — its smooth, dark surface etched with the names of 58,318 service men and women who died during the Vietnam War. It is a smaller, near perfect replica mirroring the one in Washington, D.C.
One man, an Army veteran, approached the wall. He went directly to a particular panel and began reading the names. “I’m looking for Vernon Shrock,” he said. 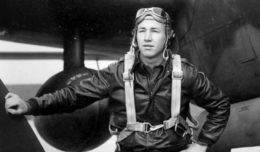 Shrock had been a private in the U.S. Army when they first met and became good friends – Shrock was later killed by an explosive in Quang Ngai, Vietnam. This veteran and many others came to visit the Mobile Vietnam Memorial Wall, sometimes called the AV Wall, an installation special to the 2017 Marine Corps Air Station Miramar Air Show at MCAS Miramar, Calif., Sept. 22 to 24. The wall is a half-scale replica of the Vietnam War Memorial in D.C., and volunteers with Point Man Antelope Valley (PMAV) maintain it. 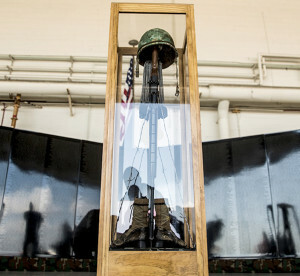 The theme for the air show is “A Salute to Vietnam Veterans,” a theme MCAS Miramar and 3rd Marine Aircraft Wing leaders treated with a solemn regard. 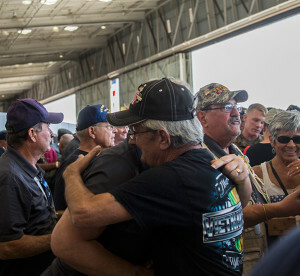 AV Wall volunteers observed Vietnam veterans, surviving family members, friends and active-duty service members as they entered the hangar to find and pay homage to their loved ones, many of whom died during the war and others who remain missing, even to this today. If anyone needed help finding a certain name, volunteers readily stepped in to assist. “We’ve actually heard people say ‘we came because we knew there was going to be a wall,’ ” said Stacia Nemeth, an AV Wall volunteer. “So many of the Vietnam veterans felt so unappreciated upon their return from war … they are reaching out and needing a hug, needing a thank you, needing a handshake. One volunteer in particular, Augie Anderson, said he viewed his service as a way to grieve the death of his brother Sgt. Richard Carter, a soldier from Milwaukee, Wisconsin, who died Nov. 19, 1967, in Tay Ninh, Vietnam. 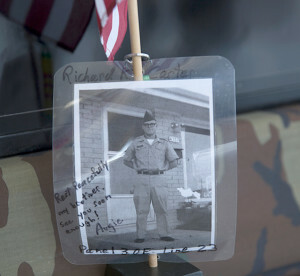 Anderson remembers his brother by placing an American flag accompanied by a photograph of his brother in uniform, positioned in front of the wall beneath his name. Veterans, family members and other guests stand quietly during the invocation of a pinning ceremony at the Mobile Vietnam Memorial Wall, also known as the AV Wall, during the 2017 Marine Corps Air Station Miramar Air Show at MCAS Miramar, Calif., Sept. 23. AV Wall volunteers, family members and active duty service members gave lapel pins to Vietnam veterans to commemorate their service and express gratitude. Other people came to take photographs of names. Some copied the engraving with a sheet of paper and a pencil, others sat in silence and still others found solace in sharing bits and pieces about their loved ones, who live on in memory alone. Twice a day, volunteers held a pinning ceremony and formally recognized any Vietnam veterans who attended, thanking them for their service. “To see the effect on the visitors and to see the effect particularly on the veterans is just the most rewarding thing ever. It has been the most rewarding thing I have done,” said Nemeth. With the air show’s close, the memorial wall will return to its home in Lancaster, California. However, each name on the wall is available through an online database at www.vvmf.org, which shares information about the service men and women whose names exist on the memorial wall – enabling people to find their loved ones, view photographs, rank and branch of service, location on the memorial, place of death and more.